Richard Pearson, from Sunderland, flooded the art world with paintings and drawings purported to be by "pitman painter" Norman Cornish. Northumberland County Council has started work on new flood prevention measures for Corbridge after the impact of Storm Desmond. Six months after Storm Desmond battered Northumberland, flooding nearly 200 homes, we've learned 88 families are still waiting to go home. The A69 is blocked both ways after an accident involving two vehicles on the A68 / B6529 Stagshaw Road (Stagshaw Roundabout). Debris is causing problems. This is affecting traffic between Northumberland and Corbridge. Northumberland suffered £24 million damage due to the floods with the Tyne Valley worst affected. 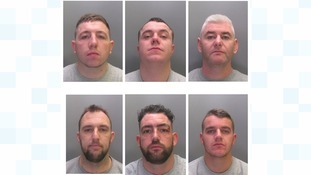 Six gang members have been sentenced after they were caught stealing a cash machine in Corbridge, Northumberland. The landslip, which caused part of the Carlisle to Newcastle rail line to close, is expected to re-open fully on Monday, February 8. The massive landslip which caused part of the Newcastle to Carlisle rail line to close for the last month, has finally been cleared.